Friedman Fine Art, in collaboration with NELSON, designed, fabricated and installed the client history donor wall for the trademark specialty law firm of Pattishall, McAuliffe, Newbury, Hilliard & Geraldson LLP. 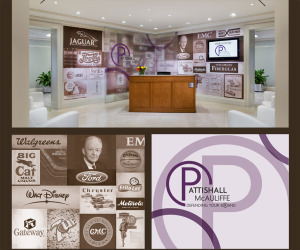 The montage wall was designed to highlight some of the firm’s many prestigious clients. Friedman Fine Art has been developing corporate and institutional art and graphic programs for the past 40 years. Our firm represents and collaborates with the finest designers, fabricators and installation teams resulting in magnificent interior graphic programs. For more examples of our work, visit our website Friedman Fine Art.